One week on our herbs, Z and her mother came to see us. It was a big surprise indeed. Z seemed to have “recovered” and appeared okay and well. I could not believe that Z would recover that fast. Chris: After the installed the shunt in your head, you here discharged and went home. How long were you at home before you came to see us? Mother: She was at home for about a week. C: While at home that week, how was your condition? Well and healthy as this morning? Z: No. I am much better now. M: After taking the herbs for about two days she started to improve. She felt better. Now, you see she can smile and talk to you. Before taking the herbs, she would not even want to talk to anyone and would not smile! C: How was her condition while at home that week — any pain? M: She was always drowsy. Slept for a while, then woke up for a while and then went to sleep again. Now, she can go shopping already! I am really glad to be able to help Z to get well. Praise God the All Mighty for this wonderful blessing! But then, will this blessing last? It all depends on you — the patient! Most often, patients get sick again after believing that they are already well. That’s human nature! After one week of an apparent good health, Z’s father came to our centre and reported that this morning Z had problem again, like before. My question was, What did you do wrong, a day or two before this? Go home and ask. Find out what had happened. In the meantime Z should take Pain Tea. A week later, Z and both her parents came to our centre. Chris: Now, tell me what did you do wrong last week? What did you eat a day or two before the problem cropped up? Mother: I cooked Thai Fragrant Rice. She ate that. She took it for dinner. Then in the night she started to have problems — dizziness of her head like before. C: Given a scale of 0 to 10, what would give to this situation? M: About 2.5 (out of 10). C: I gave the Pain Tea. And you took that? M: Her problem started to improve after taking the Pain Tea. Now, she is back to about 7.5 — not yet fully recovered yet, like before. She is a bit slow and still finding difficulty talking normally. C: At first I thought the shunt that they installed in her head could be blocked. But from what you told me, it could not be the cause of her problem. Why don’t you go back to the doctor and ask him about this. But for me, I think the problem is the food! I don’t know what chemicals they use to make the rice fragrant! I have not eaten this kind of rice before too. And this is something you have not eaten before, why do you want her to eat something that you have not eaten before? M: We pity her, so I thought she should eat this special rice. Chris: Well, we like to pity people, but by our ignorance we can also kill people. As I am writing this story. I receive an email from another brain cancer patient who is now blind after his surgery and radiotherapy. Since the past few weeks, he had been on our therapy and his health improved tremendously. Then I received this email. Hello Prof .. Apa Kabar ?? Prof Malam tadi Brother saya Kejang , kemudian Mata Sebelah Kanan Agak sedikit Berat , Dan Jahitan Di Kepala Bekas Oprasi Agak sedikit Sakit Prof.
My reply: Makan apa yang salah —- 1 atau 2 hari ini —- Buat apa yang salah? Makan ikan goreng pakai minyak Wijen dan Beras ketan. Note: Just a week ago, this same brother wrote to ask if the patient can eat pizza or not! My answer, NO! There it goes, another silly mistake! Just madness that patients and his/her caregivers don’t seem to be able to learn. Let me share with you another story. There was this lung cancer man who ate durian at about 3 p.m. By 6 p.m. he landed in the ICU of one hospital. A CT scan showed there was nothing wrong with him, although he was breathless. The doctor told the son, The problem could be due to the durian! 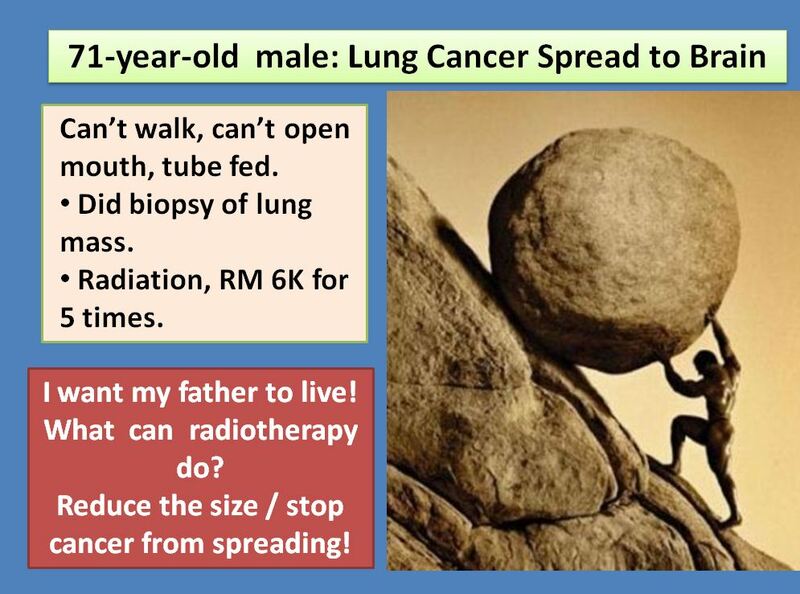 Did he expect the CT scan to show a durian in this man this man’s lung? Many patients died after eating durian — that much I can say! One patient died after eating salted fish and glutinous rice laced with sugar! Some educated minds want to ask what proof do I have to say that it is the food that caused the problem? Where is the research data to make up my conclusion? Anecdotes are not acceptable evidence in science. Well, there is no need for me to dwell in that. The proof is there! You see it and you can experience it! If you don’t believe what I say try to repeat your stupidity and see what happens. Z is a 16 plus years old girl. For the past 10 years or so, she had been having sinus problems and had been on doctor’s medication. About two months ago, August 2016, she became dizzy and had pain when moving her head. She also vomited a lot. A CT scan and MRI done showed a 35 x 30 x 30 mm enhancing mass in the region of third ventricle, at or near the left foramen of Monro. A biopsy done the next day confirmed left thalamus tumour, features consistent with a glioblastoma, WHO grade 4. The doctor implanted a VP shunt to drain out the fluid from her brain. According to the doctor in P Hospital, surgery is not an option. The only way out is radiotherapy. The parents were told that the treatment cannot cure her brain cancer. It may slow down the growth of the cancer but she will suffer a relapse within two years. This was not what her parent wanted. They wanted a cure. I received a request from her family friend (who is a pharmacist) for consultation. At first Z’s father and the pharmacist came. The next day, Z’s mother and the pharmacist came. On both mornings, we discuss how to help Z. The following are my advice to them. There is no sensible way out of this situation. I don’t see anyone on earth being able to cure brain cancer. Perhaps, the family can try another doctor in another hospital. Perhaps, the surgeon there might want to suggest surgery. But this could be just a futile effort. Z’s mother said the family decided not to let Z undergo radiotherapy. They are afraid of the side effects. And they don’t see any purpose of radiation since it does offer any chance of a cure. I also made it clear that they should not blame us if the herbs do not help Z. Take the herbs for a week or two and at the same time take care of the diet. Let’s see what happens. If the herbs do not provide any benefit then they should consider finding other people to help. The hindbrain – which is the base of the skull consisting of brain stem and cerebellum. 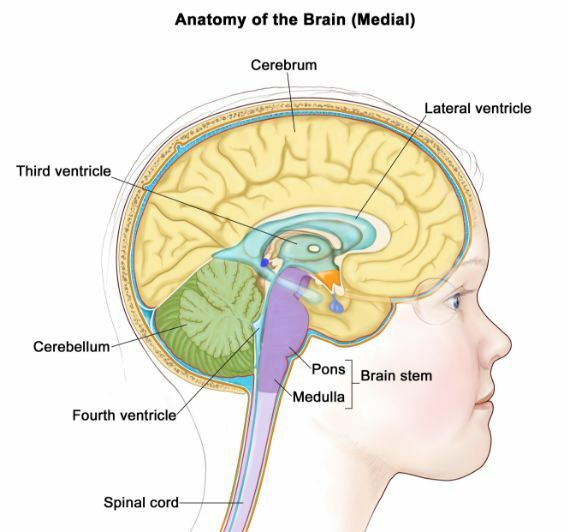 The midbrain – which is the small part of the brain stem that joins the hindbrain to the forebrain. The forebrain or cerebrum – which is the largest and most highly developed part of the brain and consists of two hemispheres which look like walnut kernel. In general, the left hemisphere controls the right side of the body and vice versa. Two large right and left lateral ventricles, located on either side of the brain. The third and fourth ventricles are placed along the midline. Within each ventricle is a network or blood vessels knows the choroid plexus. This is where the cerebrospinal fluid (CSF) is produced. The CSF is a clear, colourless fluid. Any change in this can indicate disease. The CSF fills the ventricles and the surrounding space of the brain and spinal cord where it acts as a protective buffer from injury. and transports nutrients and waste. The ventricles produce approximately glassful of CSF every day, continuously replacing it as it’s absorbed. Under normal conditions, a delicate balance exists between the amount of CSF produced and the rate at which it is absorbed. The fluid flows from the ventricles as it bathes and cushions the brain and spinal cord. The third ventricle is a narrow cavity that is located between the two halves of the brain. CSF flows into the third ventricle through openings in its roof called the foramen of Monroe. The two foramen of Monroe are connected to the left and right lateral ventricles above. 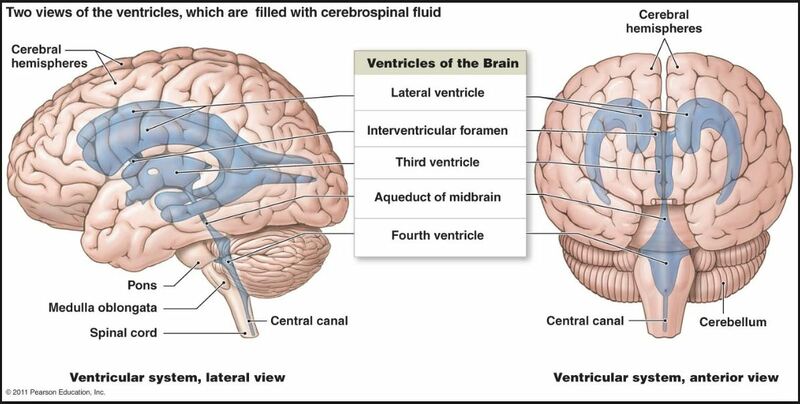 The third ventricle is connected to the fourth ventricle below by the cerebral aqueduct (canal) of Sylvius, which passes through the midbrain. If the channel through which this fluid flows is blocked then fluid accumulates in the brain. Hydrocephalus is a medical term that refers to an abnormal accumulation of CSF within cavities inside the brain called ventricles. A ventriculoperitoneal (VP) shunt is a medical device that relieves pressure on the brain caused by fluid accumulation. Patients with hydrocephalus need to undergo a surgical procedure called VP shunting. Doctors surgically place VP shunts inside one of the brain’s ventricles to divert fluid away from the brain and restore normal flow and absorption of CSF. Cysts, tumors, or inflammation in the brain can impede the normal flow of CSF and create an unsafe accumulation. Placement of a shunt is a very safe procedure. However, complications can occur during or after the procedure. Risks associated with any surgical procedure include excessive bleeding and infection. You might also experience adverse reactions to anesthesia, such as breathing difficulties, changes in heart rate, or changes in blood pressure levels. infection in the shunt or brain. Fever, headache, abdominal pain, fatigue, and a spike in blood pressure levels can indicate an infection or a malfunction of the shunt. Muscle weakness or lack of co-ordination. Loss of certain vision field. Amar (not real name) is a 32-year-old Indonesia male. In April 2016, he had a seizure and vomited. He was immediately sent to the hospital in Batam. After performing an X-ray, he was given some medication and sent home. He was able to go back work. One week later, Amar went into a coma and was sent back to the hospital again. The doctor told the family Amar had stage 4 brain cancer. He was asked to immediately undergo a brain surgery. The doctor said that was the only option left. The risk of surgery would be: Amar could suffer memory loss or he could go blind. The operation was carried out in Batam and Amar regained consciousness. The operation cost IDR 170 million. Unfortunately the surgeon was only able to remove 70 percent of the tumour. Amar was asked to undergo chemotherapy which the family rejected. This is what Amar’s brain looked like after the surgery. Amar was brought to consult two doctors in Johor Baru. One surgeon suggested that Amar should undergo another surgery to removed more of the tumour in his brain. An oncologist suggested radiotherapy. The family opted for the latter and he had 30 sessions of radiation. Radiotherapy cost the family RM 12,000. Two week after the completion of the radiation treatment, Amar became blind. As a follow up the oncologist put Amar on oral chemotherapy. Amar had three round of chemotherapy. Then his brother decided to come to Penang to seek our help. Chris: When you were asked to undergo the operation, did you ask the surgeon if he was going to be able to cure your brother? Brother: We did not ask. We did not know else to do. C: Actually, surgery would not cure anything! Then you went for radiotherapy. Did you ask if this was going to cure him? B: We asked about the benefit of radiation. The doctor said radiation cannot cure, but we need to try. We want the radiation to kill the cancer cells! C: Then the oral chemo-drug. What good will that do to your brother? Let me be very outright with you. No one can cure your brother’s cancer. For all that you have done, your brother ended up blind. You now come and see me. What do you expect me to do? B: I want to find a cure for my brother. C: That is impossible. There is really nothing much I can do. You may just waste your money and efforts. So go home and discuss with the family — what they really want to do. B: The family do not know what to do. I want to try your herbs. The son and daughter of this patient came to our centre. Yes, they felt compelled to do the utmost for their father. But sometimes, it is wiser and braver not to do a thing. In this case, it would be a bad joke to believe that 5 times radiation and a biopsy would make sense. What do you hope to achieve? To say that radiation is going to kill the cancer cells or to stop the cancer from spreading is only a good selling point, nothing than that. Let’s not be naive. Let us recall two well documented brain cancer cases in the US. Let’s see if we can learn anything from these. Senator Kennedy was diagnosed with a malignant glioma in May 2008, after being hospitalized following a seizure. A month later, he underwent what was described as “successful” surgery at Duke University Medical Center, Durham, North Carolina, and then received both chemotherapy and radiation after returning home to Massachusetts. Six months after the diagnosis, Senator Kennedy had returned to the Capitol and was working part-time while still continuing with treatment. However, in January 2009, he collapsed during the inaugural luncheon for the new president Barack Obama. Senator Kennedy died in August 2009 — barely one year after his diagnosis. Beau Biden, US vice president’s son, died at 46 of brain cancer. The son of Vice President Biden and former state attorney general of Delaware, died after battling brain cancer. In 2010, Beau Biden had suffered what officials described as a mild stroke. Three years later, 2013, he was admitted to the University of Texas M. D. Anderson Cancer Center in Houston. Doctors removed a small lesion from his brain and then followed a normal course of radiation and chemotherapy. By November 2013, he had been given a clean bill of health, but after a recurrence in 2015, Biden began an aggressive treatment and was admitted to Walter Reed. He died in May 2015. The above are outstanding “sons” of America where the best of medical treatments can be found and are available. Senator Kennedy or AG Biden would have access to the best of medical technology to combat their brain cancer. Yet, they died. What chance do we — common folks — have? Or are we being misled and sold false hope? Read what Dr. Tobias has got to say about surgery for brain cancer …. 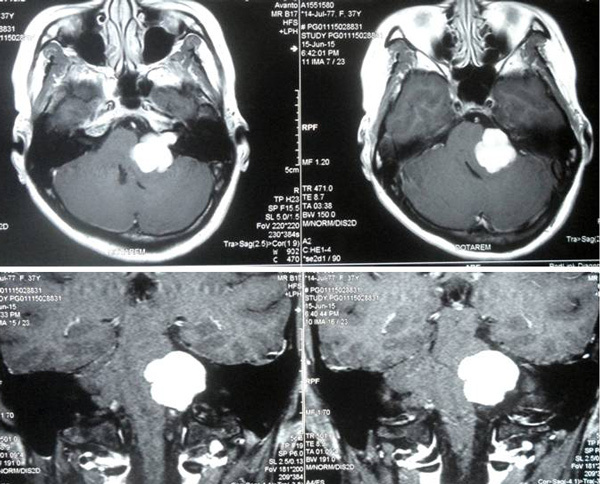 See our next posting: Brain Tumour – No to Surgery. CT is a 38-year-old Indonesian lady. About 3 years ago, she started to lose her hearing of the left ear. Later, pain developed on the left side of her head. In April 2015, the problem became more severe. She could not tell what others were saying around her. Then her left ear became deaf. When she lie down and sleep on her left side, she felt giddy. When standing with eyes closed, she lost her balance. The left arm was weak. In May 2015, she came to Singapore and consulted an ENT specialist. She was given medication for a month. Her condition worsened. She came back to Singapore again in June and had an MRI. There was a 3 cm tumour in her brain. The doctor told CT to undergo surgery immediately. CT refused. CT and her husband came to seek our help in July 2015. Listen to our conversation that morning. Husband: We saw a doctor (in Singapore). He told her to have an operation immediately. She refused. Chris: Can surgery cure her? H: Of course, can cure 99 percent. BUT have to operate the skull. Two doctors involved. One is ENT specialist and the other a neurosurgeon. C: Why don’t you want to go for the operation? Patient: But 5 percent of patients can’t swallow after that. H: She cannot control her face muscle — muscle dead. Hearing gone, and cannot be restored. C: How much is it going to cost you to operate? H: Six hundred million rupiahs, about SGD 60,000. C: After the operation, did the doctor say you need to go for chemotherapy? P: No, because the tumour cannot be completely removed, I need to go for radiation. C; You were told the operation is going to cure you — 99 percent. Now, the doctor said he cannot remove all the tumour. How can this be 99 percent cure when the tumour cannot be removed completely? Any logic? H: That’s why — no logic! P: My mom’s friend had the same problem like me. She went for an operation. She was not able to swallow after that. Saliva drooled out of her mouth. C: What happened to her now? P: She had improved but her two eyes are pointing inwards, not straight. Her husband said: Don’t go for operation, You will suffer a lot. She also had her operation in Singapore. C: Are you very sure that you don’t want to go for the operation? H: The doctor said: We do this kind of operation everyday. P: But the doctor said he cannot guarantee. H: The doctor was scared of the nerve system. C: So, it seems that 99 percent cure is not true then? I am aware that all patients want a cure. If I tell them that I can cure them, all will come to me. But I am going to be honest. I don’t want to bluff or mislead patients. Here we want to help you. Even if you take our herbs, don’t expect us to cure you. Oh, this is a very difficult problem because there is a 3 cm tumour in there. To tell you NOT to go for surgery is not right. But if you don’t want to operate, I would not force you to do that either because I know that you may have to suffer many side effects. Try to take the herbs — don’t expect us to cure you, but after a month or so, let’s see what happen. May be after this, it can give you an indication and direction — whether what we are doing is correct or not. Ask yourself — After taking the herbs, how do I feel? Better? Less problems? Worse? If better, then be patient and we continue. We have helped many patients with brain tumour before. Now, let us try our best to find a way out — to help you. The tumour is not going to disappear. But if you can lead a normal life, please don’t ask for more. After 3 months, if you find that the herbs do not help you, please go for the operation. I can’t help you anymore. CT was told to undergo surgery immediately! Why immediately? She had been living with her problems for the past 3 years! No need to panic. Take time to evaluate your options. Can the best of medicine in the world cure brain cancer? This week, there are 3 sad stories about brain cancer. On Saturday, Joseph “Beau” Biden, the son of Vice President Joe Biden and former attorney general of Delaware, died following a long battle against brain cancer. The 46-year-old’s death raises new questions about the disease that killed him—one that’s alarmingly common in adults and chronically misunderstood by the public. This past year there were nearly 70,000 new cases and 14,000 deaths from this disease. There are many different types (of brain cancer) that occur in adults—each with a unique set of features. Each types carries with it a separate prognosis—ranging from a life expectancy of eight months to non-life threatening. Glioblastoma is an aggressive and often fatal tumor, with an estimated 2-year survival rate of around 17 percent for patients between 40 and 65 years old. The underlying cause of GBM is unknown. It’s still unclear which specific type of tumor that Biden suffered from, but whether malignant or benign, it’s clear that the treatment to keep it from coming back ultimately failed. Treatment options typically include a combination of radiation, chemotherapy, and surgery. The goal of surgery is usually to reduce the tumor burden, followed by radiation therapy and certain chemotherapeutics. Chemotherapy may delay the disease course in some cases, but most chemotherapeutic agents for GBM have an extremely low response rate, around 10 percent. The prognosis is not particularly good for any age group. A variety of malignant brain and central nervous system tumors kill about 15,000 people in the United States each year, often after difficult courses of surgery, radiation and chemotherapy. Beau Biden was first diagnosed in August 2013 and after surgery, radiation and chemotherapy returned to normal duties in November that year. But his cancer recurred this spring, and he began treatment again at Walter Reed National Military Medical Center. Former Massachusetts senator Edward M. Kennedy died in August 2009, 15 months after he suffered a seizure and was diagnosed with a malignant glioma, the most common form of brain cancer. 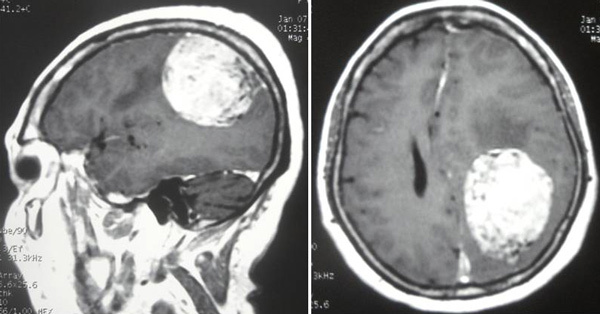 For most incurable brain tumors, the primary challenge is managing the portions of the tumor that are undetectable by diagnostic imaging, These tumor cells are often the source of recurrence, traveling undetected to other brain regions of the patient and then driving the formation of new areas of growth with little warning. Most malignant brain tumors eventually recur. Beau Biden had been dealing with health problems since 2010, when he suffered from a stroke. Three years later … after he suddenly felt disorientated and weak during a vacation, he was admitted to M.D. Anderson Cancer Center in Houston. Not long after that, he was diagnosed with brain cancer. He underwent surgery and was free of the cancer; however, it returned this spring. Biden underwent aggressive treatmentat Walter Reed National Military Medical Center in Bethesda, Md. We do not know what causes brain cancer. Most brain tumors are not linked to any known risk factors. While there is no proof that radiation causes cancer, we do know that radiation is not good for you. The use of cell phones has long been led to debate about whether they may increase a person’s risk for brain cancer. Current research shows conflicting results. Regardless, it is probably a good idea to limit cell phone use as much as possible or at least use a hands-free headset to reduce your exposure to radiation. Details about Biden’s healthprior to his death are scarce. What is known is that he was hospitalized the week up until his death at Walter Reed National Military Medical Center, and that he did have a small lesion removed from his brain in 2013 at University of Texas M.D. Anderson Cancer Center, but was given a clean bill of health after the procedure. No matter what, almost all the time you’re talking about a kind of tumor that is going to come back and become more resistant to therapies,” Weiss, who specializes in treating adult malignant and benign brain tumors, tells Yahoo Health. “That’s why you hear these patients have a brain tumor, a primary brain tumor, and they’ve been given a clean bill of health. But they’re never really in a position” to have a clean bill of health for the rest of their lives, she says. Thank you for reading this message! 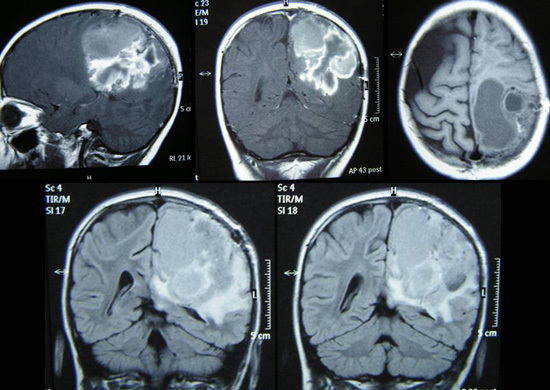 I know it is hard for u to make any diagnosis without seeing the patient – but can I just ask before I bring my 32 year old wife over from Singapore if you are able to help her treat Glioblatoma Multiforme Grade 4 brain cancer. She has done surgery to remove 70% of tumor on 28 April and has not started on Chemo/ Radiation. We hope to let her do Immmunotherapy (T cell) before bringing her to u for treatment – do u advise that and know of a reliable hospital/ clinic in Malaysia for recommendation? Please for your kind advice! Reply: I have bad impression of IT! Can we seek your treatment for glioblastoma? … can we please seek your help for her glioblastoma? Can extend? For how long? Reply: Can’t say or predict. My sister is a cancer patient with brain tumors, grade 4, high grade glioblastoma. Sep 2013- She fainted and was sent to hospital, scan showed she had some bleeding in her brain. Oct 2013- another scan showed that she had a 3cm big tumor. She had her tumors removed in Oct 2013 by X of General Hospital Penang due to emergency. Oct 2014-her tumors grew back and scan report found that there’re 5 tumors. She had undergone 2 sessions of radiotherapy and 3 sessions of chemotherapy since then. There is no more chemotherapy for her. Her brain swell every week and had to go for dripping and treat with mannitol. She has strong will to survive as she has a 4 year old daughter. Please save her. We would like to make an appointment with you to see if there’s any advice from you. I look forward to your reply. Warm regards. Reply: I am sorry I cannot save her. Her cancer is very, very difficult. Although it looks like her condition is very critical but she has very good blood test report, all her other organs are functioning very well. Other than her speech problem and body coordination due to her brain’s tumors, she has clear mind, strong surviving will, she eats very well and pass motions and urine as normal person. I just feel that if you’ve any herbs that can help to alleviate the swell and cancer cells in her brain, that would be very helpful. My mother and her husband are there at your clinic now to seek your opinion. Please at least give them some advice. My mother has been very careful in her diet … It was very surprise to see a glioblastoma cancer patient to survive more than 5 months. My sister has already passed her 1.5 years after diagnosed. Mdm H is my patient since 2014 with brain cancer, now recurrence with multiple nodules in the brain. This has left her with weakness of her limbs, unsteady gait and double vision. She is therefore dependent and reliant on her carers for mobilising and self-care at home. Her disability is deemed permanent in view of her recurrence of cancer in the brain. She gets agitated and irritated due to her tumour in the brain. Hope you will understand the emotional changes that she is going through due to her illness. Mdm H underwent surgery on 18 October 2013. This was followed by 30 sessions of radiation and 2 cycles of chemotherapy given as 12 injections. The drug used was Avastin. By 2 September 2014, H was told that there was NO MORE cancer! Her mother said H was cured! Unfortunately, about 2 months after this “great news” the cancer came back again. H again underwent chemotherapy. After the 11th injection, the oncologist in a private hospital told her to go and seek further treatment in a government hospital. As far as he is concerned he could not help H anymore. At this point, the family decided to come to us for help. I told the family. I cannot cure your cancer. Brain Tumour: Operation, you have an 80 percent chance of cure! Do you believe that? Brain Cancer – Yet She Lives ! Siti is a 59-year-old lady from Indonesia. Sometime in 2014, she had problems with her speech. A doctor in Medan said there was a tumour in her brain. Siti was prescribed some medications and was told to undergo surgery. There was no other option except surgery. Siti refused because of the risks associated with the procedure. The surgery in Medan would cost her IDR 60 million. Not satisfied, Siti came to Penang for a second opinion. Again she was told that surgery was her only option. This would cost RM 25,000. Again Siti refused the treatment. Siti returned to Indonesia and did nothing. She did not have much problems. In February 2015, she came to seek our opinion. She presented with weakness in both legs, headaches on and off and her right leg felt heavy. Chris: Can the operation cure your cancer? Siti’s sister: The doctor said if she did not go for the surgery, she would be blind, may have seizures and probably may not be able to move. If she were to undergo an operation, she would have an 80 percent chance of cure. However, the procedure has risks. There could be severe bleeding. She might have a stroke or end up in a coma. C: Do you believe that the operation can give you an 80 percent chance of cure? SS: I don’t believe because I have many friends who are doctors in Indonesia. They all told me that at best she would have only a 50:50 percent chance. It is indeed with a heavy heart that we have to write this story. However, let us pray that similar story like this does not have to be played out all too often in this world of medicine. May you all find wisdom and learn from this sad experience. In the month of May, I had this exchange of e-mails. Our family and I migrated to Australia 22 years ago in 1990 from Malaysia as a skilled migrants and live in Australia ever since. This is very sad to let you know that my young Architect daughter has brain cancer (grade IV Glioblastoma multiforme) which diagnosed six months ago and under chemo treatment by cancer Specialist in … Australia. I searched the internet and found that your holistic approach towards healing and advocate the use of herbs for all cancer patient. I would like to buy your herbs. We have a strong faith in Nichiren Buddhism (Japanese) and praying hard for my daughter recovery. She has a positive attitude (and looking towards to be better healthy life. Kindly let me know the cost and instructions so that I can remit money to you. Sincerely thanks. Please reply. Kind regards. Reply: I am sorry we cannot help patients from foreign countries, especially from Australia. We may have problems with your quarantine. Also we are not a direct selling outfit. Chris. Thanks for your email reply. I try very hard to contact you through the phone on +604 – 6595881 and it goes to a fax tone. Can you please email me your direct phone contact (not mobile) so that we can have a phone conversation and it does not cost me very much. I can always take a flight back Penang to buy the herbal medicine from you after you have establish which type of herbs are good for my daughter and bring them myself. I am very well verse of her brain cancer illness conditions and I can explain to you thoroughly every aspect of her cancer condition and her history. I have a medical file which recorded every chemo treatment and western medicine she has taken including chemo drugs – Termozolmide (Temodal) and now on Avastin (bevacizumab) infusion. I am waiting for your email now and call you, please. My family and I are in very desperate situation and we have a lot of pain in our mind and hearts. Hope you understand our feeling as parents and we are praying very hard and trying extremely hard to save our daughter’s life. Avastin — spreads cancer! That’s the drug they gave you! There is NO need to talk to me over the phone because there is NOTHING I can do. I need to see the scans and medical reports. Unfortunately the herbs are very bitter and have lousy taste and smell. Not many people can drink them. But that 6-year-old could take them without problem. I do not talk over the phone for obvious reason that everyone on this earth want to talk to me about their problems. I just cannot cope. Actually I would not want to have patients from overseas. ..NO use …but if you want to come, it is okay with me and then you can get your friends and relatives to send the herbs to you. I cannot handle all these chores. Let me give you a brief medical history of my daughter. She has brain cancer – Grade IV Glioblastoma multiforme on her Brain Stem diagnosed 6 months ago in October 2012. Very much earlier in September 2009, she had diffused Glioma on her brain stem and was treated with 30 doses of Radiation-Chemotherapy over a period of 6 weeks and the Diffused Glioma shrunk and life was back to normal. 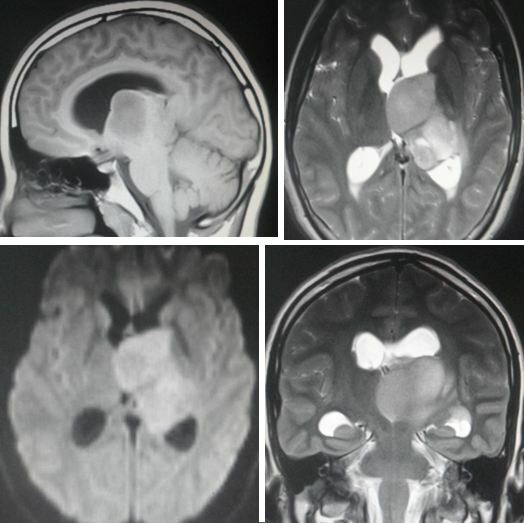 Things started to change end of October 2012, recurrence of diffused low grade brain stem glioma with high grade transformation in the cerebellum. Also, they are aggressive tumours now. Admitted to hospital and neurosurgeon has done a surgery to implant a Brain Shunt to relief the brain pressure built up and at the same time, biopsy taken. MRI Head Scan on 25 March 2013 was done and sad to say that the tumours had grown back to size even bigger than before. Her condition deteriorated quickly, Medical Oncologist changed to the use of Avastin (becacizumab) infusion. First Avastin infusion was on 4 April 2013. After 3 weeks, second Avastin Infusion on 24 April 2013. And at present, her condition seems not improving. She is bed bound, unable to sit on wheelchair, blur vision, slurred speech, right hand shaking, upper and lower limbs very weak, overall health very weak and unable to eat by herself – feeding needed by mother. Her condition has deteriorated fast just a matter of 4 weeks. Dr. Teo, I will definitely come over to consult you and show you all the MRI head scans. I am really working extremely hard to save my daughter. Sincerely thanks, Please reply. Regards. a) There is NO cure for cancer. The type of cancer she has cannot be cure by anybody. b) The most intelligent thing to do is STOP doing the chemo because it does not work and may even spread the cancer more. See what Avastin does to people in the attached file. c) After that go to www.BookOnCancer.org and read my book on Cancer What Now — there I have explained everything you need to know. This is written specially for people who come and see me and their expectations. d) Don’t be misled that there is a cure for cancer. THERE IS NONE. Even if you come to me in a hurry there is NOTHING much I can do except to give you the herbs and hope for the best. e) I see problems like yours everyday — when doctors gave up, they come to me and expect me to cure them. NO way. Very kind of you for your quick reply. I have my own reason of coming to see you ASAP and I will explain to you when I see you either on this Friday 3 May 2013 or this Sunday 5 May 2013. We know there is no cure for this brain cancer and we don’t expect very much as well but just to prolong her life and with your herbs so that she can live a few more year with her strong religious faith, positive attitude and thinking which can create her own strong immune system, control diet and then there is a chance for her to live longer. At present, she is bed bound and can’t eat by herself, terrible to see my own daughter like this and it is very painful for parents. Tomorrow morning I will ask my son to book a flight to KL and connecting flight to Penang by Air Asia and hopefully to see Friday or Sunday afternoon as stated in the website or please advise. I think the flight will be on this Friday early morning at 5 am. Perth time is the same as Penang time. My son is studying hard for his university exams now. There will be no more Avastin infusion till 15 May 2013 and we still have time to stop it. Before that Avastin infusion, she needs to have an MRI Head Scan first and see any improvement on the size of tumours. And if no improvement, then treatment with Avastin infusion will also stop. Looking forward to see you soon, Dr. Chris Teo.I have been reading your website on newsletters and other material and you are a remarkable Doctor. Please reply. Regards. Very sad to inform you that when I arrived in Australia early Sunday morning (5/5/13), my daughter has passed away. Terrible news for the family. Sincerely thanks. Regards. In the first two weeks of January 2011, we encountered three brain cancer cases at CA Care. On 1 Janaury 2011, we received this e-mail. We are based in Melbourne and came to know about CA Care through a close family friend in Kuala Lumpur. As we are unable to come there ourselves, the family friend will be visiting the centre with Z ‘s medical reports and scans. Z started with headaches and neckaches in early 2010. We only notified the problem when her eyes and mouth cannot move correctly in around March 2010. We had been visiting few doctors, until she started vomiting in the morning, one of the doctor recommended to do a brain CT scan for her. It was done on the 12nd May 2010. Z was referred to Melbourne Royal Children Hospital immediately after the scan. A size of a tennis ball tumor was found in her brain. She had an urgent brain surgery on 15th May 2010. The surgeon and the oncologist suggested radiotherapy and chemotherapy, but we refused to do so. We putted her on Bill Henderson’s cancer free diet since June 2010. Unfortunately her tumor re-grows. Now the surgeon and oncologist recommended the same thing again, surgery and radiotherapy. But we refused to do surgery immediately. On 13 January 2011, was another e-mail. My name is J. I am contacting you from Adelaide, South Australia. My father has got a brain tumour and has had it since 2004. He has undergone three operations along with radiotherapy and chemotherapy treatments and is now looking for other treatment options. He mentioned to me that he heard that there is other treatment offered in Indonesia and asked me to investigate. What are your thoughts about the treatment you offer and if you think it’ll be beneficial to my father, and what is the process in commencing this treatment. On 9 January 2011, we received this e-mail. We are coming to see you from Kuala Lumpur today. We should reach your office around 7 p.m.
H504, nine-year-old girl came to our centre with her parents as stated in the above e-mail. She had a three-month history of weakness of the right upper limb which progressed to her right hemiparesis (weakness on one side of the body). 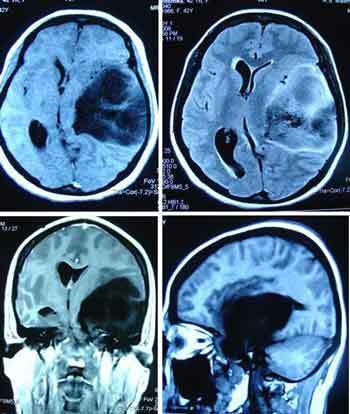 A MRI scan showed a large solid tumour with cystic areas in the left parieto-temporal lobe extending to the thalamus. Surgery was done on 15 November 2010. This cost RM 50,000. According to the surgeon only 60 to 70% of the tumour was removed. The histology is that of a sPNET (supra-tentorial primitive neuro-ectodermal tumour). No chemotherapy or radiotherapy was indicated after the surgery. MRI done on 6 December 2010, i.e. about three weeks after the surgery, still showed a very large residual tumour, 8 x 7 x 6 cm, in the left parieto-temporal lobe extending to the thalamus. A neurosurgeon in one private hospital was of the opinion that a second surgical resection could safely be done. The parents were reluctant to agree to this. The treatment plan after the proposed second surgery is craniospinal radiotherapy (CSI) followed by four consecutive courses of high-dose chemotherapy with autologous stem cell rescue (ASCR) each time, i.e. four tandem autologous peripheral blood stem cell transplants over a four to five month period.This procedure would cost about RM 200,000. The parents were told that there could be a 50 to 70% chance (whatever that means?) if the residual tumour is first removed to about 10% of its size. The procedure carries a risk of causing some degree of handicap. The parents went to Singapore for a second opinion. They were told by the Singapore surgeon that a second surgery could be done with good chance recovery (whatever that means again!). The operation in Singapore would cost S$60,000. Whenever I come across brain cancer cases in CA Care, I cannot help but remember the book, The Scalpel and the Soul written by Dr. Allan Hamilton – a neurosurgeon at the Arizona Health Sciences Centre, USA. Dr. Hamilton wrote a great book and I greatly admire him. Let me highlight some of the brain cancer cases that Dr. Hamilton wrote about. There are many things we can learn from these stories. Let these stories be the bench mark upon which you base your decisions when it comes to brain cancer. “I was expert at using computer-guidance systems for neurosurgery, so I was not surprised that Candy asked me to do the biopsy procedure. This kind of biopsy is dangerous – there would be little margin for error. We would need to enter the brain in a relatively posterior location and then skirt past the motor cortex, where all the muscle coordination for the body lies. Then we’d have to slip seamlessly through millions of motor cell cables and sensory cells to gain access to a structure called the pulvinar. This was where the tumour seemed to have its epicenter. We plotted four different trajectories … and looked over on the computer. The team had done hundreds of biopsies together, but this was definitely going to be one of the most challenging cases. There was little doubt we would get the job done, but could we get it done right? One of the advantages of computer guidance is that you know within a millimeter exactly where you need to drill through the skull. In fact, the incision of this kind of surgery is less than half the width of the nail on your pinky finger. We close it up with a single stitch and cover it with one of those dot Band-Aids, so I could assure Taylor she wouldn’t lose any hair. No one would even be able to see the incision unless she pointed it out. Alfred was thirteen years old when he felt that his right arm and right leg were not functioning properly. Something must have gone wrong in his brain. A CT scan and MRI showed a large tumour in his brain stem – no doubt a malignant glioma. “The patient is affixed to a precisely machined head ring … It’s attached … by four pins directly to the bone of the skull. It must be absolutely unmovable. The patient then undergoes CT and MR imaging. A sophisticated software program allows the surgeon to pick out the target. A tiny hole is drilled into the skull at the exact entry point picked up by the computer program. A foot-long probe is slid into postion. It passes down through the substance of the brain stem, almost to the hilt. The patient is awake so that brain stem function can be assessed. Each time the probe moved into position, Alfred’s speech would become noticeably slurred. From the computer coordinates … I carefully took a small piece. When I withdrew the biopsy cannula, Alfred’s speech immediately cleared, returning to normal. “Alfred underwent the usual six-week course of radiation treatments. As always, this was followed by a long course of chemotherapy and steroids. His hair fell out. His weight, under the incessant appetite stimulus of steroids, ballooned up to nearly two hundred pounds. He also broke out in a raging case of acne from the steroids. Another brain tumour-induced disfiguration before my eyes. The tumour resisted everything we threw at it. Alfred lost control of his legs. Donald was a twenty-three year old truck driver. He suffered from pounding headache that soon became a daily event. Often the headaches came on with nausea. The sunlight on the road and reflection off the windshield bothered him. CT showed a peach-sized tumour in the back of the brain – in the occipital lobe. The tumour caused a significant amount of swelling and pressure on the brain. “After six hours of surgery, the tumour was removed. He made excellent recovery and was eating breakfast the morning after. He was discharged two days later. What followed was six weeks of nonstop radiation therapy delivered every single day. I saw Donald lose his hair. I saw the grinding fatigue set it. The circles beneath his eyes. 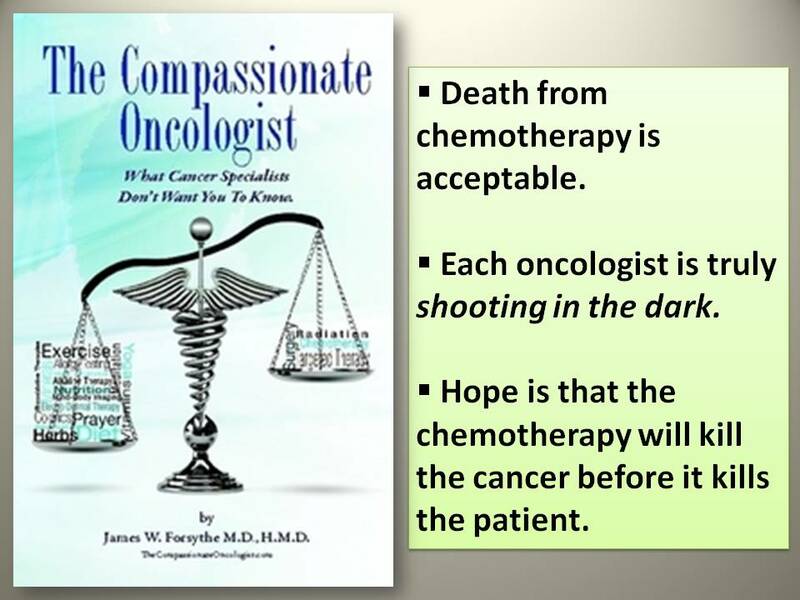 As soon as the radiation was finished, we launched into an aggressive regimen of chemotherapy for another six weeks. It was a marathon. One thing I’ve learned over the years is that every tumour is different. Every tumour is nature’s experiment of one. GBMs are almost never cured. Only five out of five thousand patients with GBM had survived five years or more. The odds of being a long-term survivor were exactly one in a thousand. But the bottom line is that GBMs are usually incurable. You never get to stop the treatments – the only way to hold this tumour at bay was to keep pounding away at it. For the second year, Donald’s scan appeared reasonably dormant. The tumour seemed to be in remission. In the third year, however, the tumour did return. With a vengeance. It was like a creature that had been wounded, had gotten up and was now stalking him … the tumour was growing rapidly. I reviewed the scans. We would need to start a new line of aggressive therapy. We also decided to resect as much of the solid tumour as we could. So once again, I would have to go back into Donald’s brain and attack the tumour surgically. Following surgery, he threw himself with total concentration into the next round of energy-depleting chemotherapy. Within three months, the tumour’s spread was clogging the flow through the ventricles … we made the decision to take Donald to the operating room and relieve the obstruction. The operation took an hour and a half. I installed a device called a ventriculoperitoneal shunt (VP-shunt). By the end of the surgery, Donald was wide awake. He was back as bright as a brand-new penny. Because the tumour was still growing, we turned to more experimental, far-out chemotherapies. Over the next three months …. the shunt was keeping him out of life-threatening danger. In the spring – on April Fools’ Day – the shunt malfunctioned. It was completely blocked – tumour cells were growing inside it. Donald sank into a coma. Sidney (Sy) is Dr. Hamilton’s colleague. He was one of the United State’s outstanding Alzheimer’s disease specialists. 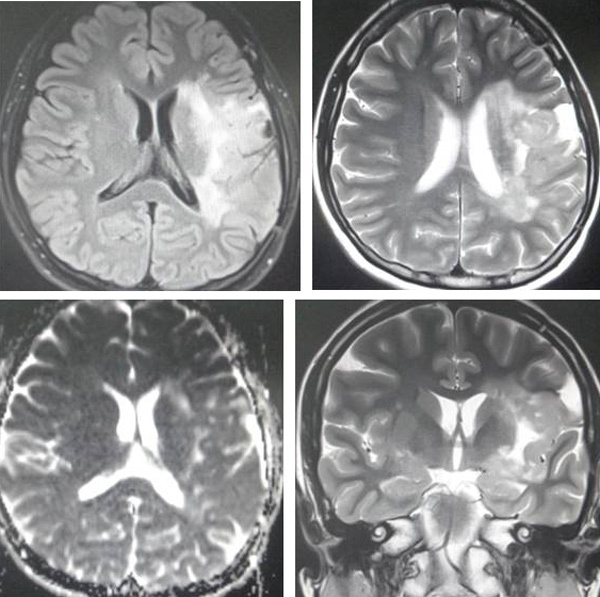 He had a large brain tumour – the dreaded GBM. Dr. Hamilton described this case was “one of my most public failures in my career as a neurosurgeon.” This is how the story goes. “The tumour had grown into his speech area. For me, it was paradoxically dreadful. I could end up making things worse. The risk was I might actually destroy his speech capacity in the process of removing the tumour. “It took almost two hours from when we removed the tumour to when we finished reconstructing the skull and closing all the layers of muscle and skin. I wheeled Sydney back to the recovery area. Sy could process and understand speech perfectly, but he couldn’t utter a single word. My inner state was stark and miserable. I had failed Sy. My skills had failed us both. I didn’t have a choice. I had to sacrifice the small artery along with the tumour wall … I knew that … I might be sealing Sy’s fate. I wondered if we would ever be able to say another word. If not, it would be my doing. “Much of my neurosurgical practice is devoted to brain tumours. I’ve had the honour of taking care of hundreds of patients with astrocytomas, malignant brain cancers. Very few survive for more than a couple of years. As I mentioned, the odds for long-term survival can be a thousand to one. To be cured one needs to be lucky indeed – it’s a real long shot. Thank goodness every neurosurgeon who deals with astrocytomas has at least some survivors. Without this handful of the lucky few … it would be difficult to keep going. As surgeons, of course we must often resign ourselves to our patients’ unfortunate outcomes. “Rusty was an alcoholic, chain-smoker and a ne’er-do-well person who attaches himself to women and convince them to live with him. He has brain tumour. Rusty would come into clinic with his latest girlfriend. Usually he reeked of booze and sometimes he was downright obnoxious. When he was drunk, he had a habit of hanging off my shoulder as if he was my best buddy. Or he’d come swaggering down the hall, yelling, “Hey, doc! How ya doin’? Rusty was about two years out from the time of his original diagnosis. He had lived with three different girlfriends during that interval. After thirteen years, in 2003, when I saw Rusty again in clinic, his scan hadn’t changed one bit. He still drank excessively, but he settled down with his mom and became a pretty good cook for the two of them. “ Paul was an engineering student who had a malignant astrocytoma. I resected it a week later. The severity of subsequent radiation and chemotherapy forced him to suspend his studies for an entire semester. The following year, he returned to his master’s degree. On the final scans at the completion of treatment, there was no visibile trace of a tumour. He got married and started working on his Ph.D.
Paul’s scan remained pristinely clean of any recurrent tumour. He’d been able to finish up a very challenging doctoral dissertation. Our whole clinic staff attended his graduation. We threw a small party for him. There were five candles on the “birthday” cake one of the nurses had baked – one for each year he’d survived from his initial diagnosis. He was my first five-year survivor. As said earlier, I have great admiration for Dr. Hamilton. I admired his expertise, his humility, his deep sense of connectedness with humanity, his dedication to his noble profession and patient and his compassion towards his patients. I say this in my heart. If your want to fight and get even with cancer – this would be the man who would help you with the battle of your life. I read again and again the words written by Dr. Hamilton above. I would like to say as loudly as I can: the world needs more surgeons like this great man. Dr. Hamilton’s book opened my eyes to what modern, high-tech, brain surgery could do. The techniques and scientific tools are so impressive! But let us not be caught up with impressive tools and technology. More importantly, we need a pair of wonder hands who could do things with compassion and love. Then, ultimately, it is the results that count. At CA Care we too have the privilege to help patients with brain cancer. We do not have those magical tools – ours are primitive by any standard – just drink bitter, smelly herbs. The tools may be primitive but we too have scored a few home runs! Daisy of Indonesia, Sunan of Thailand, CT of Medan,and a twelve-year-old girl from Penang, using only herbs. For details click the appropriate links. We talk about our great saves but also about our great failures, and we all have them. The question … to answer was why we fail at what we set out to do in the world. We have just two reasons. The first is ignorance – we may err because science has given us only a partial understanding of the world and how it works. The second is ineptitude – in these instances the knowledge exists, yet we fail to apply it correctly. Failure of ignorance we can forgive. If the knowledge of the best thing to do in a given situation does not exist, we are happy to have people simply make their best effort. But if the knowledge exists and is not applied correctly, it is difficult not to be infuriated… philosophers gave these failures so unmerciful a name – ineptitude. Those on the receiving end use other words, like negligence or even heartlessness. CT, 42 years old, came to see us in September 2008. There was a tumour in her head. The neurosurgeon in a private hospital in Penang told the family that she must undergo surgery immediately. Without the surgery CT would become blind and paralysed. If she underwent surgery, there was no guarantee that she would be cured. The family decided against further medical treatment and came to seek our help on 12 September 2008. CT was prescribed Capsule A, Brain 1 and Brain 2 teas, C-tea + Brain Leaf tea. Two days on the herbs, CT’s condition improved and all pains were gone. She was able to talk better. She returned to her hometown, Medan, Indonesia. Two months later, CT came back to see us again. Her health was restored. After this second visit we never get to see CT again. Some months later, we had news that CT was not well. Well, we thought this was it – the end of the story – since she had not been taking herbs anymore. In the meantime, we were rather excited about her healing story. This was yet another miraculous healing which we can share with you all. We made 10 video clips documenting her healing. But our efforts seemed meaningless since we didn’t even know what the end result was. These video clips were stored away – forgotten. About two years later – June 2010 – CT’s neighbors came to our centre. They told us that CT was still doing fine. We were taken aback by this news thinking that she was not around anymore. Of course we were really happy and grateful to hear this news. On 1 October 2010, CT’s relatives came to see us. They again told us that CT was indeed well. Let us follow CT’s healing story by listening to these videos which we thought would not have seen day light anymore. Our conversation was in Bahasa Indonesia. To help those who don’t understand the language, there is a brief English summary after each clip. Yes, she is healthy now and is teaching in her school. Thank God for everything – that she is well. At one time, she ate meat and became ill.
Now if she walks in the sun, she gets headaches or become giddy. CT came to see my husband in the hospital. She asked us to come and see you immediately. My husband has nose cancer. You have seen her? Is she alright? She said she will come to see you one day. I did not expect to be able to help her – it’s God’s blessing. 2. To Operate or Not To Operate? RM 19,000. Can operation cure her? No guarantee – not sure. If no operation, she would be paralysed. With operation would she end up paralysed as well? Don’t know! Do you want to operate? The surgeon said this must be done immediately. Decide quickly. Do you want to know the experiences of other patients? 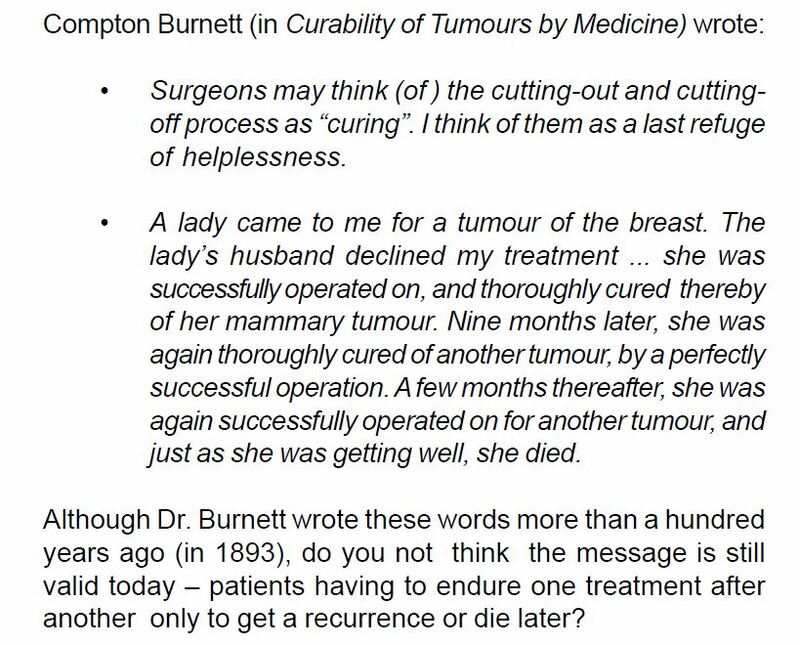 a) For one patient, the tumour recurred and grew bigger than the initial tumour that was removed soon after the operation. b) My friend’s wife was urged to operate immediately, although I cautioned him against this. After the operation she was paralysed and died soon afterwards. c) Another patient had surgery. The tumour recurred. He had surgery again and again. After that this same surgeon told the brother. Please bring him home (to Jakarta, before he dies in the hospital)! I cannot encourage you to go for the operation. But I also cannot say: Don’t go for the operation. (This has to be entirely your decision. I cannot take responsibility for this decision). In whatever you do, the most important point is: Can you achieve a cure? But it is uncertain – there is no guarantee. Now, even if you take my herbs, I cannot guarantee that you can be cured. So, what is your decision? I shall prescribe you some herbs. You can try drinking them. Let’s see if these will help you. Within 2 weeks, we should be able to know if they help or not. If the herbs help and you get better, continue taking them. There was this man, Ramli, from Aceh. He had brain cancer like you. He was also asked to operate. He refused and came to see me. He took herbs. After a week he came back – looking better and was able to sit down and talk to me nicely. Before that he was not able to sit and talk. He was full of anger. He went home to Aceh and was able to ride his motorbike and travelled over 100 km. After three months, he stopped taking the herbs. He suffered a relapse. Went to a hospital in Aceh, underwent an operation and died. So it is now up to you what you want to do. One important point: You must take care of your diet. You cannot eat anything you like. No meat, no sugar, etc for you. These are not good for your cancer. For the past two months she had been having headaches. Her speech was slurry. One day she vomited and was unconscious. Later she developed severe headaches. They were so severe that she yelled in pain. I am going to give all the herbs that I have for brain cancer. From my experience these herbs help patients with such problem. God help you. So go home and talk to God. We should be able to know the outcome within two weeks. If there is no progress – then I really don’t know what else to do. You came on Friday – only 2 days ago. How are you today? Look at me first before we talk! Okay, you looked better. Your face looks good and clear. No more dizzy! Blurred vision has improved! The surgeon told us that if there was no operation, within a week there would be bleeding and she would be paralysed. Thank God. Now we are on the right direction – proceed! What kind of fish can I ….? Wait first, wait first. I am not going to talk about food yet. Can I eat bread? Wait. Let me tell you this; All patients – when they are dying they will follow my diet advice. But when are get better they will want to start eating anything they like! After taking the herbs for 2 days, how did you feel? I felt a “flowing” sensation in my left leg – like massage. I also felt the “flow” in my left side of the head. But there was no pain. Before the herbs, my face swelled a bit. After a day on the herbs, the swelling subsided. Are you better? You went home to Medan. Did you still continue taking the herbs? Yes – I took them three times a day! Was the herbs bitter? Oh yes, really bitter! I vomited for about ten times after taking the herbs. Brain 1 and Brain 2 did not cause any problem. It was the C-tea and Brain Leaf that made me vomit. That was strange, I thought it was the Brain Teas that were difficult to drink, not the C-tea and Brain leaf. I thought these were good tasting – I too used to drink them. Initially, the diet was not good tasting doc! When I ate too much I vomited. She did not eat well, that made her weak. Can I meat mutton? Oh, no! It is important that you eat well. You cannot live without eating. But just eat proper food. Take a lot of fruits! Take beans, etc. I was amazed doc, the pains in my head were all gone. Previously you said there were severe pains. She was in severe pains. They had to tie her down while in the hospital. She could not control herself and was yelling in pain. For 8 days she was in pain and was always full of anger. She was angry with everyone. She was angry with the doctor, etc. Let me ask you about your memory. Can you remember things? Any problem with your memory? Before she used to forget things. Now she is starting to remember things – her memory is improving. Before the herbs, the pastor came to visit her. The next day she could not remember the visit. Now it is improving. Now, can you remember your friends, what happened, etc. Yes! I just want to go back to work. Go back to school and teach again? Can you do that? Yes! Can you write? Can you read? Yes, I can. What about your bodily movements? I could not lift heavy things because I did not have much strength. What about walking, etc. Any problem? CT stood up – she showed us how to kick a ball! Since the past 2 months that you were on herbs, did you experience any problems? Nothing much, but she always like to sleep. Of course, she needs to relax. Okay, think back – what could have happened if you were to have that operation. Honestly, I did not expect you would recover. I believe God helped you. At the same time, I have also encountered many similar experiences like yours with other patients. For example, Prapti. I did not except her to survive. But she did. I am indeed happy. Since the herbs helped you, continue taking them. Take care and God bless you. Daisy (not real name), then a 21-year-old female, presented with vomiting and headaches. A CTscan indicated obstructive hydrocephalus. Her condition returned to normalcy after the installation of V-P shunts. Barely one and a half years later Daisy suffered a relapse. Subsequent imaging indicated tumors in the brain and this was diagnosed as pineoblastoma. Daisy was in a coma and had to be warded in the intensive care unit of the hospital. Medically she was written off. Doctors told her parents to find whatever “cures” they thought would help Daisy. A stranger told her parents about CA Care herbs. Two weeks after taking the herbs, Daisy emerged from coma and was discharged from the hospital. She suffered total memory loss and had to learn how to read and do the basic household chores all over again. Daisy remained well for more than 5 years. She only took herbs. Daisy said: While in the hospital, mine was a dark world. I did not see any images, and I did not feel any pain. And I did not remember hearing anything too. But although I was in a coma, I was not brain-dead. According to my mother, I did react to what was going on around me in the ward. When my friends came they cried and told me not to leave them yet. My mother said my eyes were also full of tears when my friends cried. At one time, I became very angry. At times, I laughed. When my judo coach from Korea came, I talked to him in Korean much to the amazement of those around me. There were times when I asked for pizza, satay, etc. Nevertheless, I could not remember all these events. My mother said that after I took your herbs, I started to pass out a lot of urine and it was dark and dirty. My parents panicked and called Uncle Patoppoi to check what had happened. Uncle Patoppoi asked my parents to continue giving me the herbs. My friends told me that while I was in the ICU, my skin peeled off like a moulting snake. They have to apply oil to my skin. After taking your herbs for a while, one day I started to talk. My mother was beside my bed and she usually would be singing hymns. I said to her: “Oh, your hymn is out of tune” and I laughed. People around me were astonished and called the doctor and the nurses. I was alive after all. From then, I started to recover. This incident happened about a week or two after taking your herbs. I came out of the ICU and I was in the regular ward. I spent about a month doing physiotherapy. I remember telling the nurse who wheeled me to the physiotherapy room: “Where are you going to bring me. I am not sick. I am alright”. This is the first incident that I remember, the rest were all blank. I lost my ability to move around and to do things. When I saw a toy block, I thought that I could pick it up. No, I did not have the strength to do that. During physiotherapy I had to learn to do things all over again like a young child. I had to learn the alphabets, A, B, C. I rearranged the toy building blocks from one place to another. My memory came on and off. Sometimes I remembered things, sometimes I did not. There was a doll in my home. I asked my mother: “who’s doll is that?” In fact, it was mine and it was with me all the time when I was in the hospital. My mother had to teach me how to sweep the floor, wipe the table and do other house chores. Slowly, I regained all these basic skills. I helped my mother to sell things in her shop. One customer paid me 500 Rupiah. I gave him back 1000 Rupiah as change! I was home for almost a year. I did not suffer any headache or pain. However, there was one occasion when I had seizure. This caused my parents to panic. But it only occurred once and then everything was back to normal again. There was only once when I vomited while taking a walk with my father. Apart from those two events, I was recovering without any problem. After one year I became normal again. In mid-2000, I decided to dedicate my life to God. So I left home to study at a seminary (Sekolah Tinggi Telogi Berita Hihup) in Solo, West Jawa. Since your discharge from the hospital, I did not see any doctors at all. I was only taking your herbs and nothing else. Sunan, a 35-year-old man from Thailand was diagnosed with brain tumour in May 2002. The family declined surgery and gave him herbs instead. We met up with Sunan in Pattaya, Thailand, in November 2002 and found him to be doing very well. He had since gone back to his normal work. In May 2002, Sunan fell down and was unconscious. He was referred to three hospitals. There was a tumour in the brain. The secretary of Sunan’s boss called for advice. She wanted to know if Sunan needed to do a biopsy and then undergo surgery later. For this was what the doctors suggested to the family. (a) Can surgery cure? The answer was No. (b) Can surgery remove all of the tumour? The answer was No. If both the answers were negative, what then was the use of surgery? Of course the doctors have their reasons. The family decided that Sunan NOT to undergo further medical intervention. So, no biopsy was done. Sunan took herbs instead. Two weeks on the herbs, Sunan showed improvements. He was able to walk whereas before this, his walk was unbalanced. He was able to see clearly without double vision. He could see in all directions whereas previously, he could only see at eye level and not sideways or up and down. His personality changed. He became talkative whereas previously, he was a quiet man. · In 2002 had fluid in the brain (hydrocephalus) and was diagnosed with pineocytoma. · A V-P shunt (tubing) was installed but she suffered relapse six months later. · Reinstalled V-P shunt because earlier one was wrongly placed. · No further treatment ~ wait and see. · In 2004 ~ tumour grew in size. Neurosurgen suggested radiotherapy as growing tumour could kill her. Declined radiotherapy and opted for herbs. Question: Will the tumour grow further next year? Result: Tumour size decreased by 43 % (?) Pasien leads a normal life.